Class winner, champion and reserve supreme champion in the show!!! 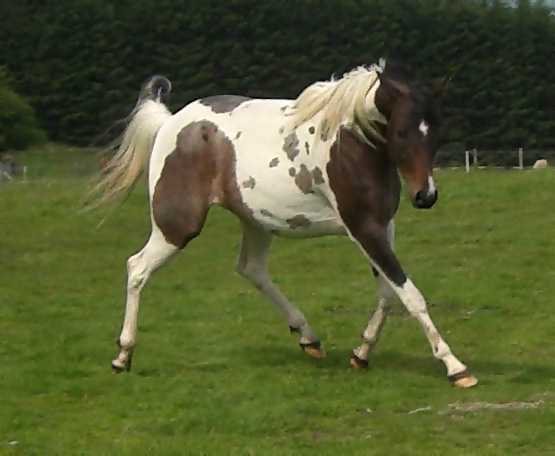 This part of our web site is now dedicated to our new venture, the exotic new breed known as the PINTABIAN , they must be over 99% pure arabian and carry the tobiano coat pattern. Please use the buttons on the left to link to their pages, some other links at the bottom of these pages too. 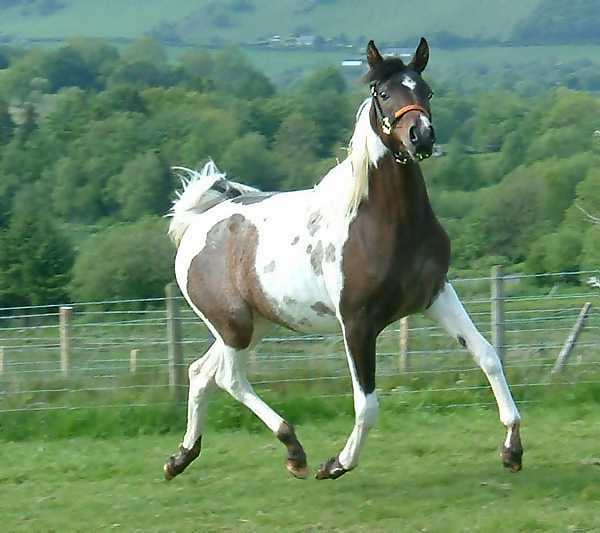 The Pintabian is a breed of horse that must be verified as having 99% or more purebred Arabian blood, with a tobiano coat pattern. 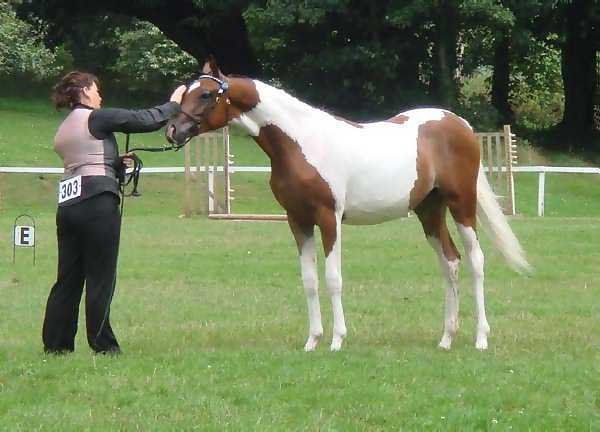 Pintabians are bred for their beauty, intelligence, disposition, stamina, and are very versatile. They have a short dished head, that is wide-set between large eyes, long arched neck, short back, level hip, and high tail carriage. For more info click here. We have now (2006) imported two beautiful pintabian mares from Jodi Blesener, Grindstone Pintabian Stud in Minnesota, USA. 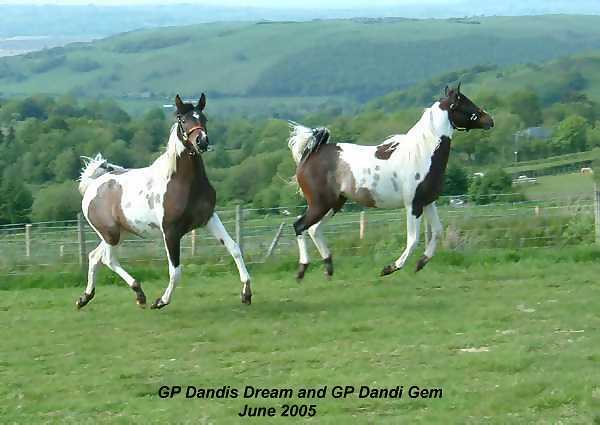 The mares are known as GP Dandi Gem, a bay and white homozygous tobiano Pintabian, 3 years old, also GP Dandis Dream a 2 year old bay and white homozygous Pintabian filly, these two beautiful girls are full sisters. 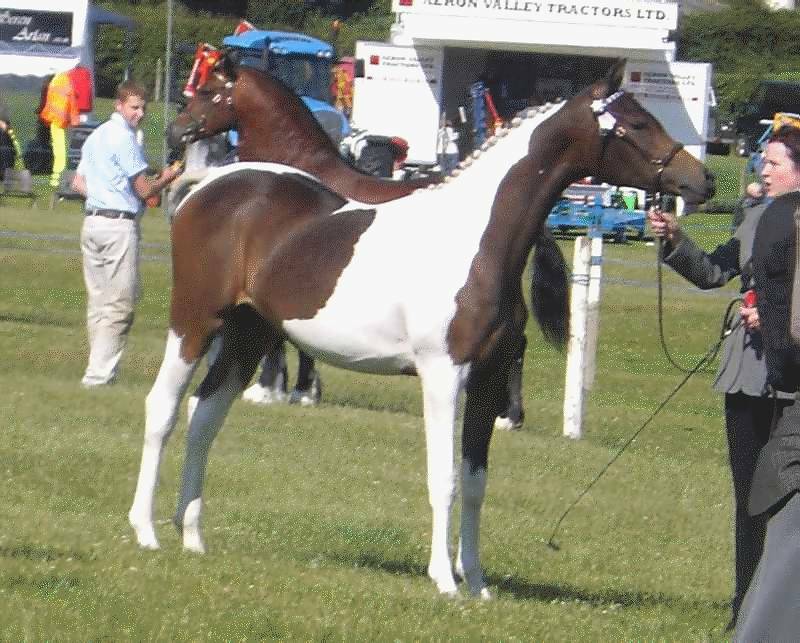 As far as we are aware we are the first (May 2006) to import a pintabian and the first to breed an all american pintabian foal (January 2007). 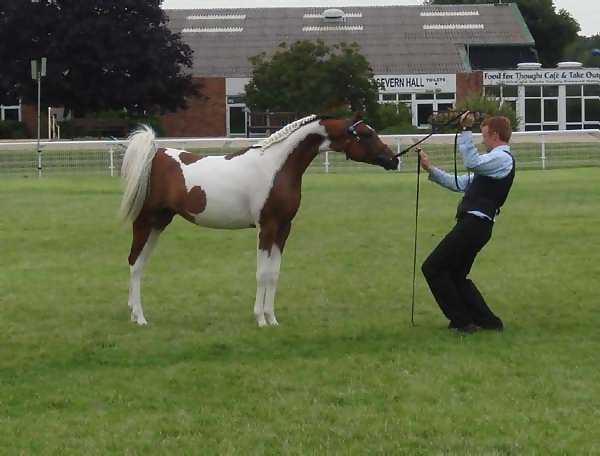 It was whilst on an internet search for a quality coloured stallion to cross on a Welsh cob mare that we discovered firstly pinto arabians then the Pintabians, the search was then on for the right "stallion" to import!! After months of searching we didn't find a stallion we wanted but two beautiful mares instead. We looked at numerous photos and a lovely dvd of them and decided they were the ones for us. 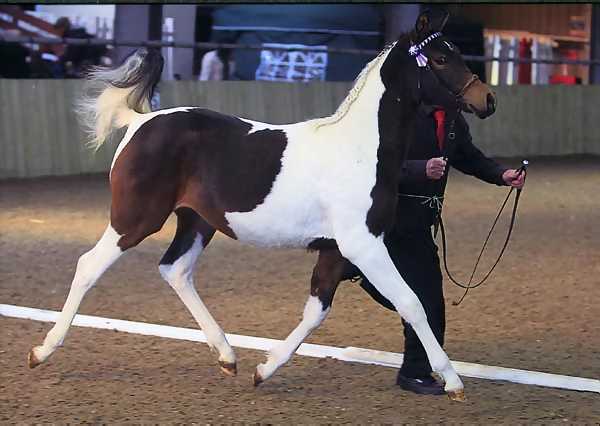 We were very fortunate that their breeder Jodi Blesener kindly offered to get Gem bred to a champion pintabian stallion who is also homozygous for tobiano and made sure she was in foal before sending them off to quarantine to begin their epic journey to us. Thirty days in quarantine and three days of travelling by air, sea and road. 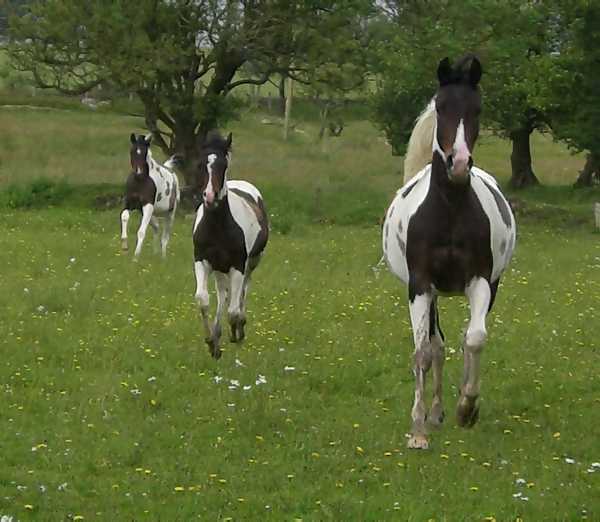 They arrived on 2nd May 2006 very tired but looking beautiful, We knew immediately that we had made the right decision. These beautiful, gentle, kind animals made themselves right at home and absolutely love human contact and crave attention, they are a real credit to their breeder. 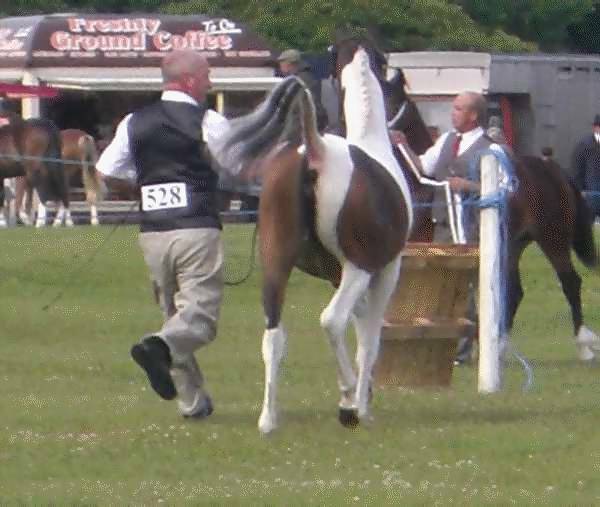 They are currently triple registered in America with The Pintabian Registry (PHRI), International Pinto Arabian Registry (IPAR) and The Pinto Horse Association of America PtHA and with The Arab Horse Society here in the UK . 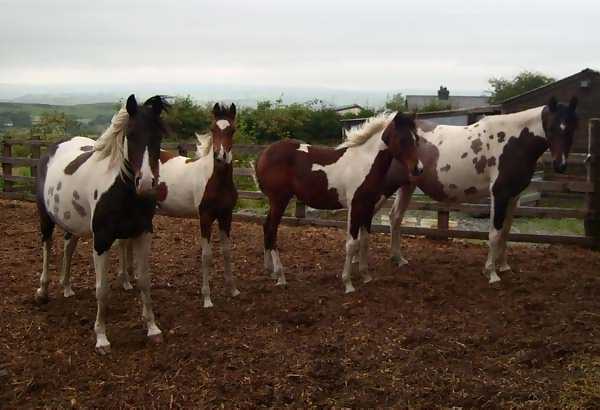 Our future plans for these girls will be to breed them to a pure arab stallion thus giving any of their offspring 99.8% arab blood, almost pure!! 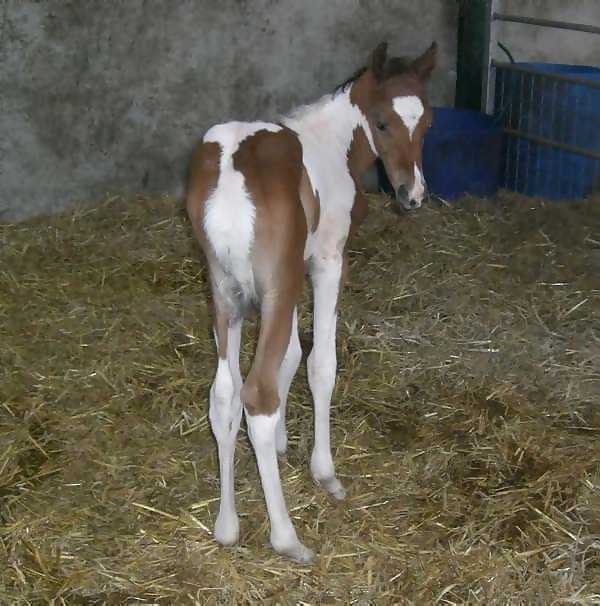 Hopefully keeping some foals to breed from or break as ridden prospects for the future and some for sale. 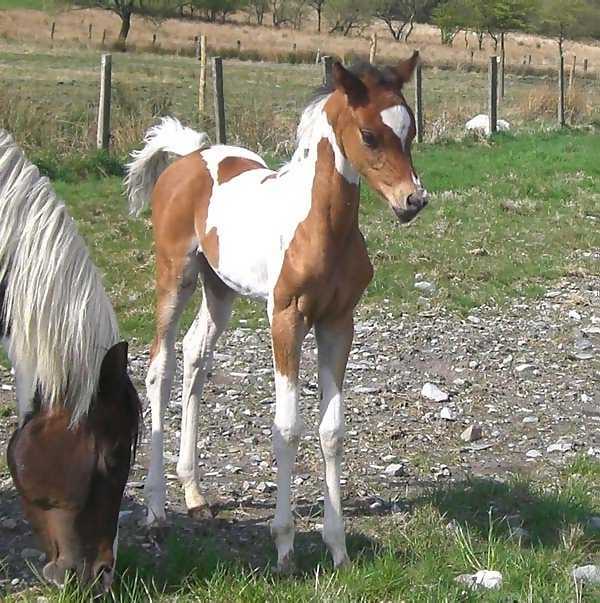 Our two pintabian foals for 2008 have now been born and both are beautiful fillies 99.8% arbian and of very good type. 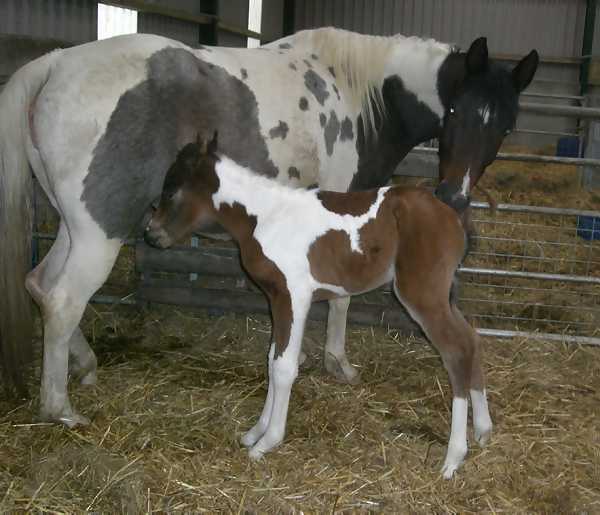 22.02.08 Beautiful Pintabian filly foal born.